Taco’s HS Series Split Case Pumps are a major advance in pump design. By using a new, modular construction technique, Taco can now make available pump performance from 83 GPM to 2201 GPM from just three basic bearing and shaft modules. This modular construction gives you simplified maintenance and the design flexibility to accommodate future performance needs. 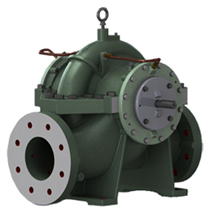 With four models to choose from, ranging from 10 HP to 100 HP, you can easily choose the optimum pump design for your specific system requirements.